Interview with founder and owner, Momosan. Genuine Japanese crafts in London, built to last. VM: Thank you for letting us talk to you further about your beautiful shop Momo. Why did you decide first open it? M: I guess I always liked the idea of owning a space ever since I was a child. Just before hitting 30, I realised it was about time to make it happen or it will never. So, I opened my shop in Shoreditch in 2011 with the help of my dear friend Rupert Blanchard who had a furniture workshop on Kingsland Road and kindly shared a slice of his space to make a shop for me. At the time, it was difficult to find genuine Japanese crafts in London. I wanted to introduce beautiful objects made by skilled craftsmen, which people can treasure for years if not generations. So, at first, it was more of a Japanese shop where I had typical Japanese items along few interesting international products that reminded of Japanese culture. I wanted to have a space where cultural exchange happens through the use of the objects. Where did the name Momosan come from? I had other name "Objects for Use”. But it was too generic as a shop name, I needed to change to be more original. Also, by then, the shop has developed into something more of the extension of myself or my relationships with makers and objects I sold. What was the reasoning behind its location? As mentioned above, It was in Shoreditch at first. But, Rupert decided to move out of that huge warehouse after Shoreditch became a bit too trendy and expensive. In a way, everything happens for a reason. I was quite happy to move and find a spot that is quieter yet visible. Only later I found that most of my regulars lived nearer to where I am now. So, it was all good. There was about half a year, I had no space in transition. But one day, my friend called me to tell there was a space in front of her house that looked like a shop front. So, I called the landlord straight away. I always loved Wilton Way. So, it was like a fate, I had to get it! But, I was not the first one to call, it took some time before the landlord was convinced to give me the space. I am so grateful to my neighbour Tom Budding, the owner of J. Glinert, a beautiful shop next to mine, for recommending me to the landlord. What’s your relationship like with your customers? Do you have regulars? I have many regulars. I feel very lucky that so many interesting people come to my shop. We share interests, they give me all sorts of advice, suggestions and they become my friends. I have collaborated with some of them. It feels I am part of this community in East London, the best part of the city. I was lucky to be invited by Tate Galleries to edit their shop in Tate Modern last year. I would love to do more of curatorial work for some other spaces. What do you enjoy most about physical retail? To meet interesting people. Also, be able to show tactile-ness of each of the pieces made by skilled makers. 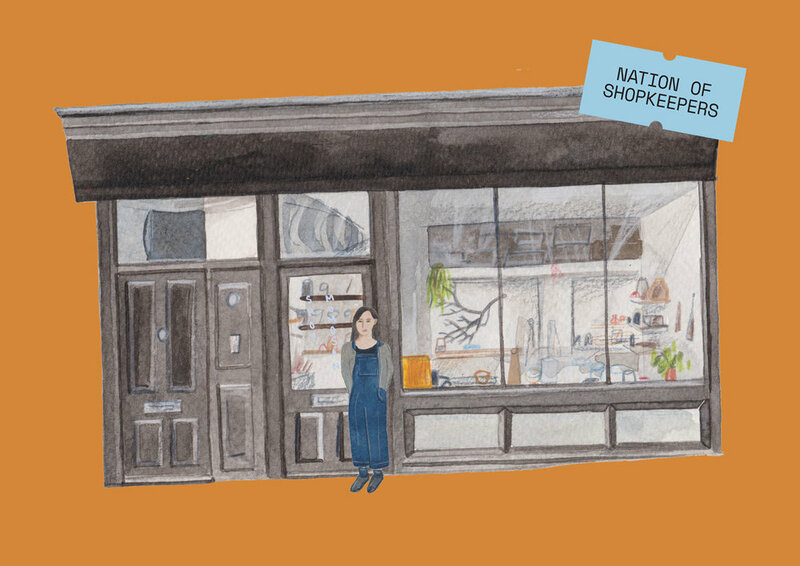 Where do you see your shop in 10 years time? I used to do everything by myself. I was a workaholic. Though, becoming a mother last year, it really has changed the way I work. I concentrate on selecting a collection, visiting studios and collaborating with makers, which I love doing. So, I am grateful I now have a great team to run the shop day to day. One thing at a time, so no big plan for the next 10 years ahead. But, I would love to have more exhibitions introducing new talents. Also, I gained much more international customers in the last year or so. It will be good to grow the businesses online. It is nice to be able to connect with the world. It is amazing how the world has become so much smaller with all this social media. By chance, I met some of customers whom I met through my shop or who bought stuff online while I was traveling in the US and Mexico. How crazy and wonderful is that!